Without power, our devices are worthless, but it can take an unusually long amount of time to get your favorite device charged up to full capacity. 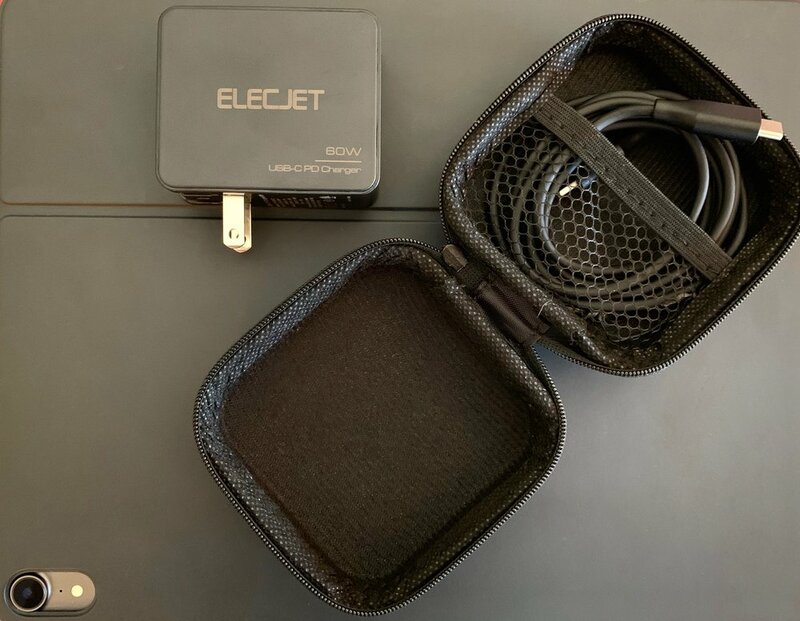 Elecjet’s new 60W Power Delivery USB Type-C Wall Charger (US$26.99) is designed to take advantage of USB Type-C’s Power Delivery (PD) feature, meaning that it optimizes the charge for devices it’s plugged into for the fastest possible charge. In this review, I take a look at this travel-friendly USB-C charger. The charger is compact — just 2.5 x 2.12 x 1 inches (6.35 x 5.34 x 2.54 cm) — and weighs just 4.4 ounces (124.7 gm). On the “back” side of the charger is a set of folding US-standard power prongs that pop out. Just flip those prongs out and plug the charger into a wall socket, and you’re ready to go. Any standard international travel adapters will work with the charger for use while traveling. On the bottom is the USB Type-C PD port, and on the “front” (as seen while it’s plugged into the wall socket) is a soft blue LED light indicating charge status. I found the color and intensity of the blue LED to be much less obtrusive to sleep than bright white or red LEDs that are commonly used. USB Type-C PD chargers are the best way to achieve a fast charge with any compatible device. The Elecjet charger works with all current MacBooks (MacBook, Pro and Air), as well as the 2018 iPad Pro. It also works with all other USB Type-C devices, like the LG G5/G6, Google ChromeBook Pixel and PixelBook, and even the Nintendo Switch. The charger identifies the device and provides an output current for the fastest possible charging. It works at 3A current and voltages of 5V, 9V, 12V, 15V and 20V. Have any devices that use Qualcomm’s QC3.0 standard for charging? The USB-C PD Charger works with those as well, outputting 3.6 - 6.5V at 3A, 6.5 - 9V at 2A, and 9 - 12V at 1.5A. I found the Elecjet 60W PD Wall Charger to work well with the 2018 iPad Pro, which of course uses the USB-C standard. Charging was about 20% faster than with the stock charging brick provided by Apple. The device is certified by various agencies including RoHS, CE and FCC, and has built-in safeguards to protect against overcharging, overheating and currents that are too high for a device. If you’re in the market for a backup USB-C charger or need to replace the one that came with your Apple device, this is a great choice. It’s $2 less expensive than Apple’s charger for the iPad Pro, $22 cheaper than the Apple 30W charger for MacBook and MacBook Air, $42 less than the Apple 61W charger for the 13-inch MacBook Pro, and $52 less than the 87W charger for the 15-inch MacBook Pro. Add to that a much more compact design and a classy carrying case, and you’ve got a winner.